Degustation Sensation – These Two Eyes! Microsoft’s Encarta Dictionary is not familiar with the word degustation, degust or degusting. The dictionary must not be a foodie. And there you have it, the art of degusting. It’s not disgusting at all. It’s delicious. For my recent birthday I put a message up asking who would be willing to fork over $150 for a degustation wine pairing at a place high on my list of atmospheric dining experiences, Anise, however only one person replied so I opted for the much more sensible Himalayan Café instead. Luckily, this week was the James Street Food and Lifestyle Trail, a culinary adventure of the delights from the best of what trendy James Street has to offer with pop up restaurants, food and wine pairings, and cultural events. 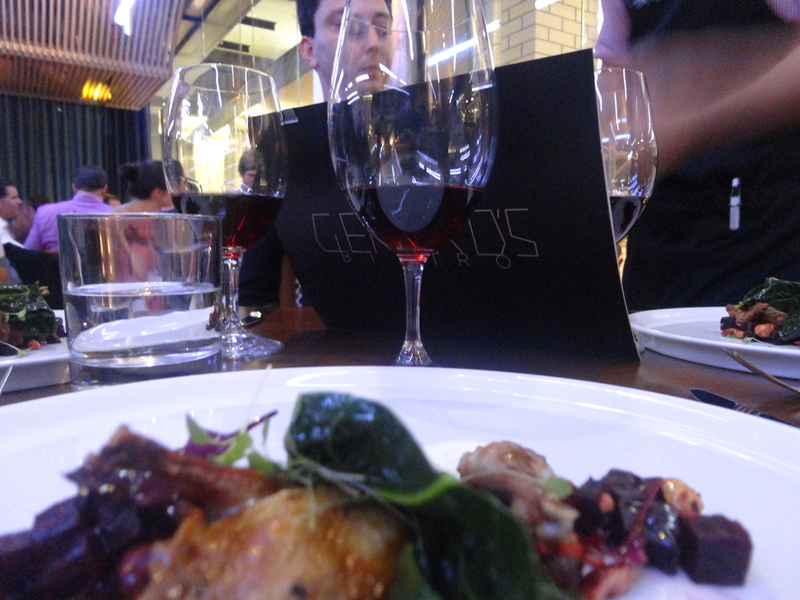 I could only choose one, so Wednesday evening it was off to recently opened Gerrard’s Bistro (where I last tried sheep brains) for their Special Degustation Menu with Ben Williamson, head chef – and a mighty good looking one might I add. Reservations were required for this art deco restaurant turned food frenzy. Arriving before the 7 pm start, tables were set neatly with cutlery, various wine glasses sized for pour and the evening’s menu set out in the middle. Our group of four was sat in front, a perfect location to listen to chef Ben Williamson explain each course in fine detail following the Red + White wine rep depicting the evenings pairing. I took out my little green moleskin notebook to begin jotting notes, assuming to go unnoticed, but then was caught red-handed. Yup, I’m a note taker – just in case I feel compelled to write home about it. Rumor has it that Prosecco is actually outselling Champagne these days due to popular demand. The pouring was generous and they even came around to top us off! 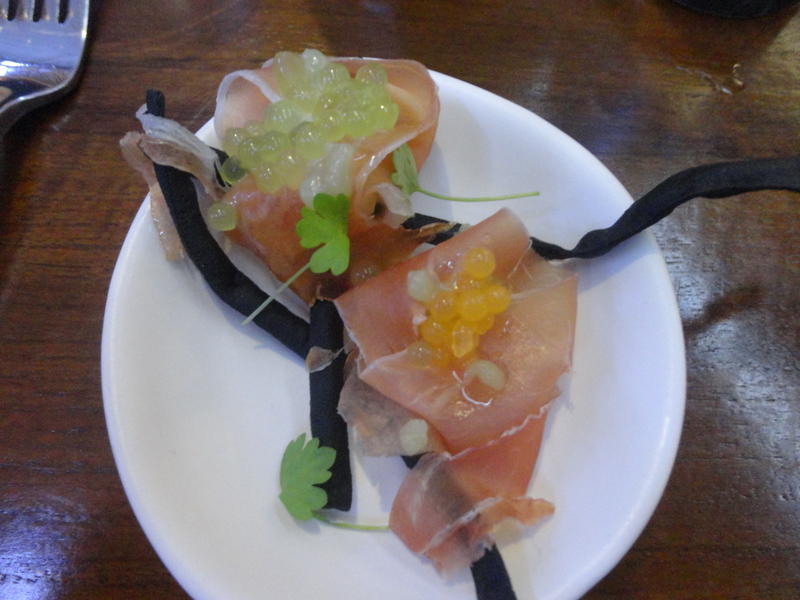 The melon on the jamon was a refreshing touch of sweet summer on the salty dry meat. The Cortese was nearly my favorite wine of the night. 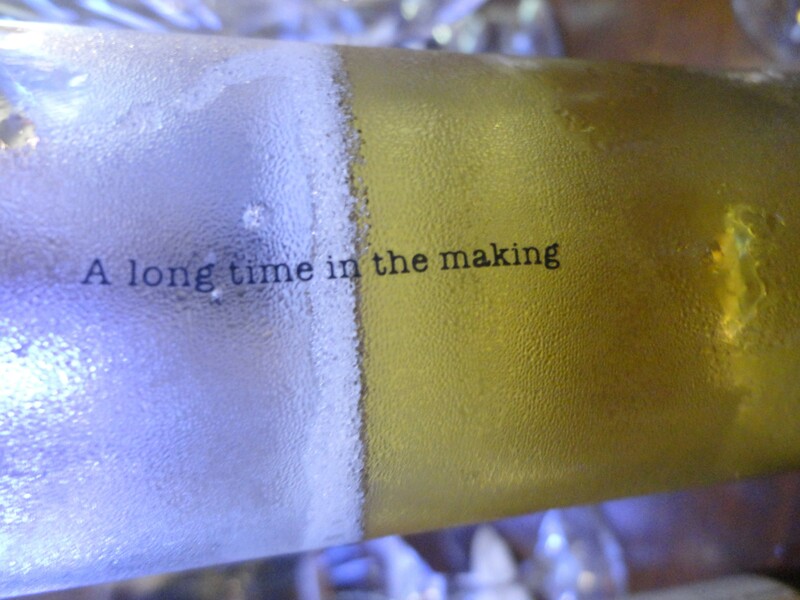 An almond, buttery undertone with a touch of apple at the finish. 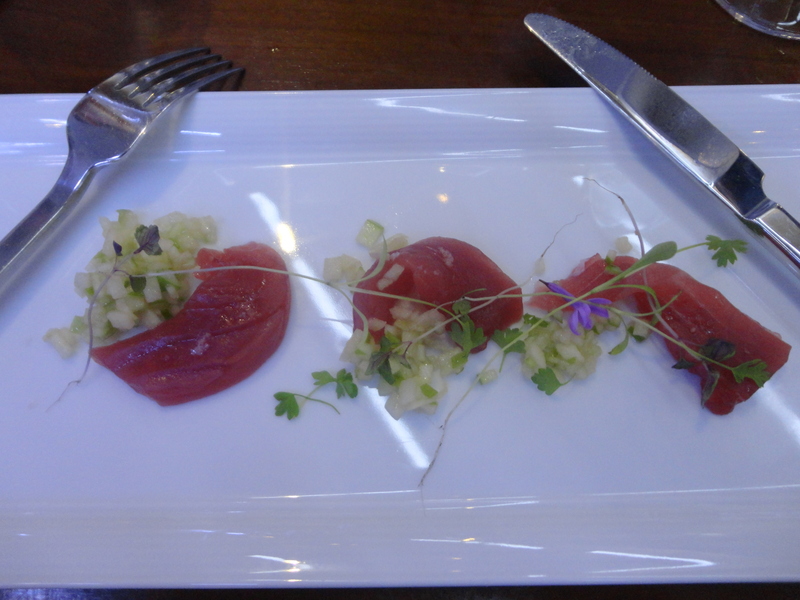 It perfectly complimented the apple accompanying the “caught that day” raw tuna. I’m a sucker for a good Pinot Noir. When my friend mentioned that she doesn’t do foreign wines, I explained that this was the reason I love a good Pinot. Also, another reason why I shouldn’t buy cheap Pinot. The bite size quail though was tender and salty but the beetroot and hazelnuts was a good balance. My first try of the Zisola was that it was too sweet and my immediate inclination was to dismiss it, but after a few swirls and sips I really opened up to it. 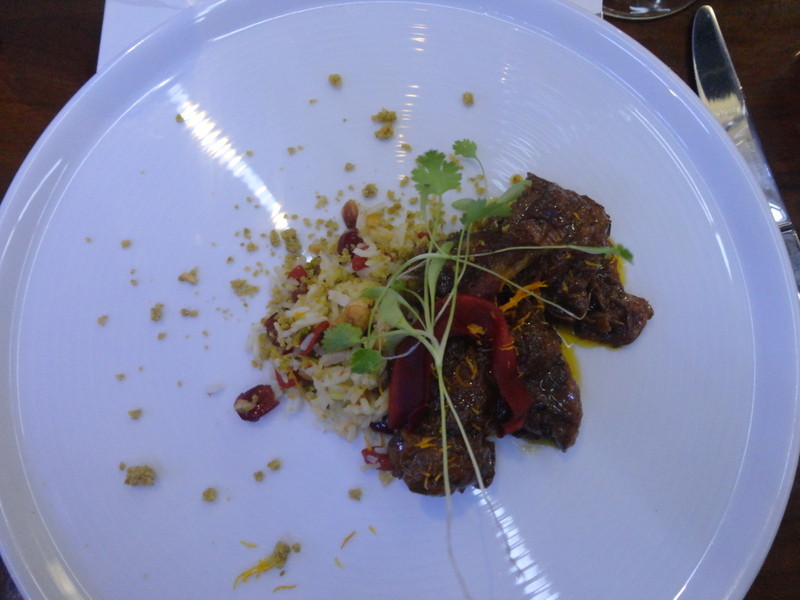 The lamb tagine was to die for, melt in your mouth, succulent tastes of joy. Really, this was by far the best dish on the menu. When my wine was poured pink I almost didn’t even give it a try. Rose, no way. But the guys at Red + White are good. 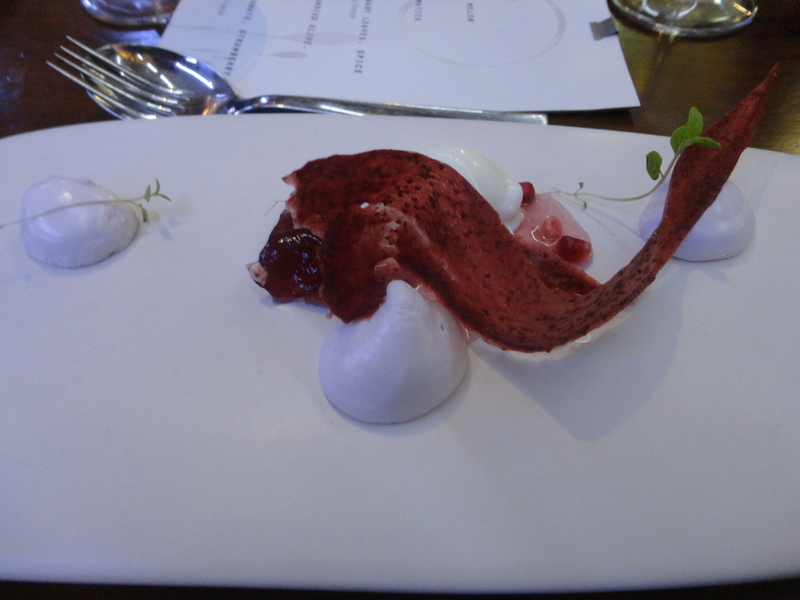 Although I was indifferent to the dessert, yes the sheep’s yogurt sorbet was sweet and who doesn’t like a good marshmallow, I could have done without. More memorable was how approachable the Rose actually was. Very mild, not overly sugary and I just say, I would drink it on a warm summer day. Nearing 11 pm this degustation has gone on for hours. Would you be surprised if I mentioned that by the end the whole room was buzzing from the euphoric atmosphere and lavish wine pours? So much so that instead of complimenting the chef on the amazing meal I was tempted to thank them for stocking my favorite Japanese soap, Aesop, which is always a pleasant surprise to find in a restaurant bathroom. Unfortunate that I could only afford one event on the James Street Food and Lifestyle Trail but I look forward to future events.